This is Block Star Elyse Knowles as you have never seen her before. Fresh off the construction site, Knowles has fronted Bras’n’Things newest campaign in a series of steamy shots wearing a raunchy range of leather and lace clad garments. A model and social influencers prior to her stint on reality TV, Knowles said she felt exposing her down to earth and often uncensored self on the show has the ability to open many doors. “I hope that it will open doors for me ... I feel like it has exposed me to a totally new market,” Knowles said. Knowles said she has been shocked by the reaction to her role on the show from many mothers. “So many mums have come up to me and thanked me for being so real on the show, and showing girls that they don’t have to fit a mould,” she said. The Victorian said shooting for Bras’n’Things was a big shift from the TV show. “It was very different to the work which I had been doing on The Block, but when you get the call up it is an honour,” she said. 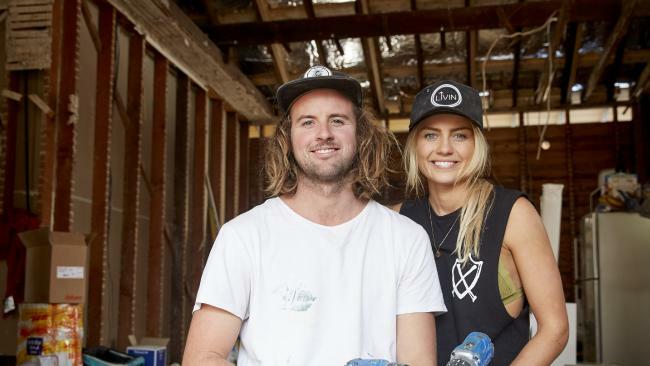 Knowles and partner Josh Barker have been a drawcard on this season of The Block which has been dominating in the ratings. This Sunday’s finale will prove if all of the effort has been worth while for the well-liked couple.